Now Kris works as night manager of a Best Western; she's tired, broke, and unhappy. One day everything changes -- a shocking act of violence turns her life upside down, and she begins to suspect that Terry sabotaged more than just the band. Kris hits the road, hoping to reunite Dürt Würk and confront the man who ruined her life. Her journey will take her from the Pennsylvania rust belt to a celebrity rehab center to a satanic music festival. 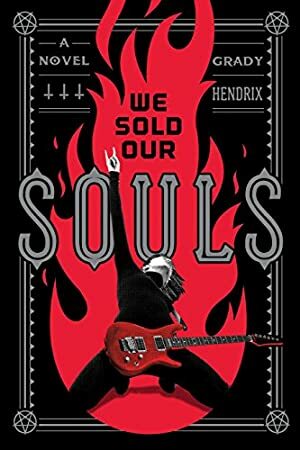 A furious power ballad about never giving up, We Sold Our Souls is one woman's epic journey to reclaim her life -- and save her soul. Track It. This book has been £5.42 within the past six months. Log In to track Grady Hendrix on eReaderIQ. to be notified each time the price drops on any book by Grady Hendrix. to stop tracking Grady Hendrix. We started tracking this book on July 28, 2018. The price of this book has changed 76 times in the past 267 days. The current price of this book is £6.56 last checked 54 minutes ago. This lowest price this book has been offered at in the past 90 days is £5.98. This lowest price this book has been offered at in the past six months is £5.42. The lowest price to date was £5.42 last reached on January 10, 2019. This book has been £5.42 one time since we started tracking it. The highest price to date was £12.34 last reached on September 27, 2018. This book has been £12.34 2 times since we started tracking it. We last verified the price of this book about 54 minutes ago. At that time, the price was £6.56. This price is subject to change. The price displayed on the Amazon.co.uk website at the time of purchase is the price you will pay for this book. Please confirm the price before making any purchases.